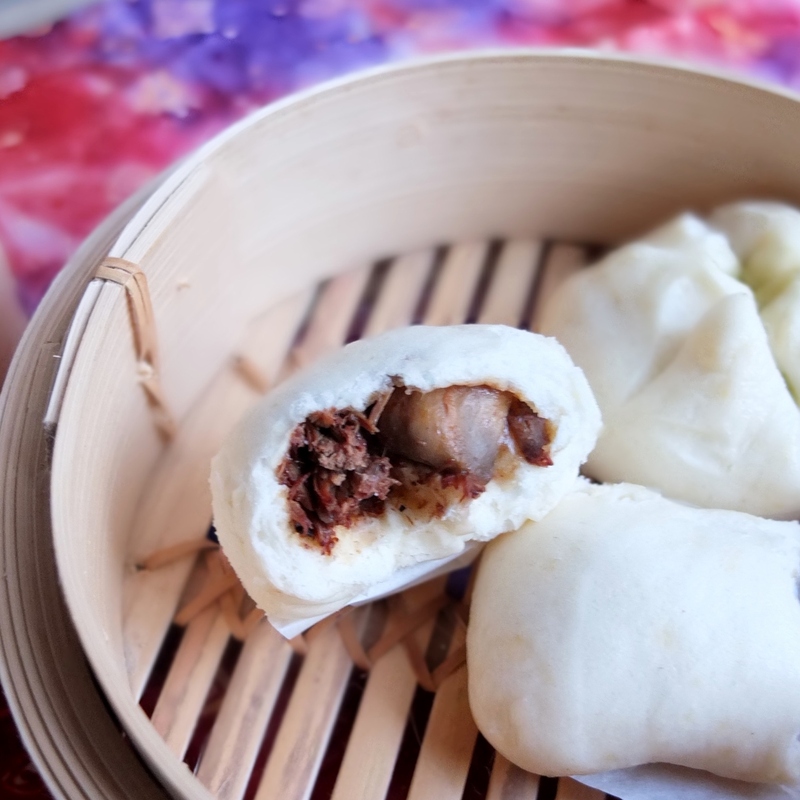 These steamed buns are easy to make and can have a great variety of fillings. 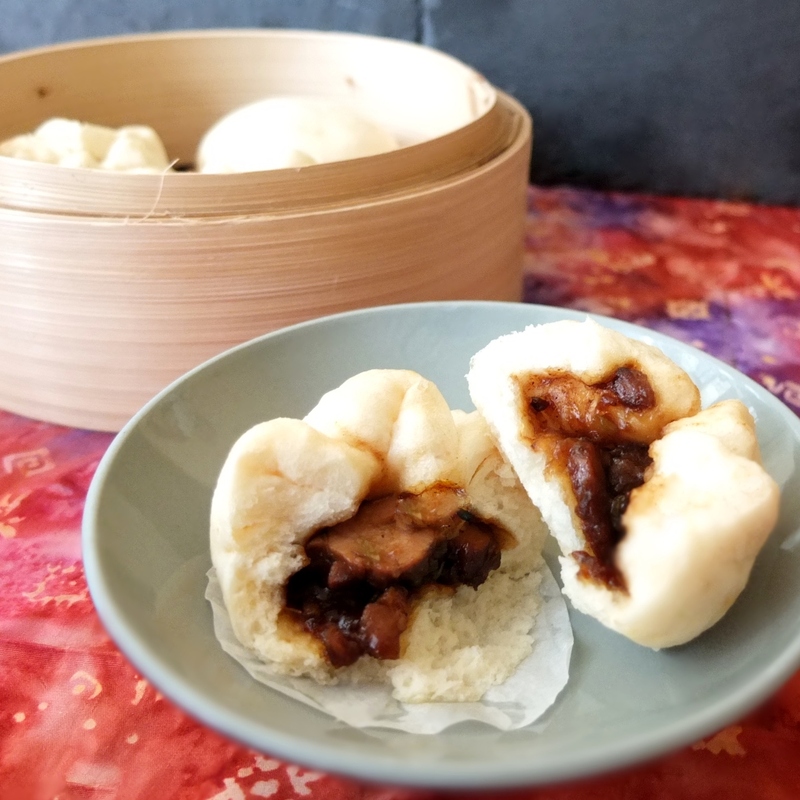 I first made them for a char siu bao (barbecued pork bun) recipe challenge and realised how versatile and wonderful this dough is. It can be so lovely, light and fluffy. 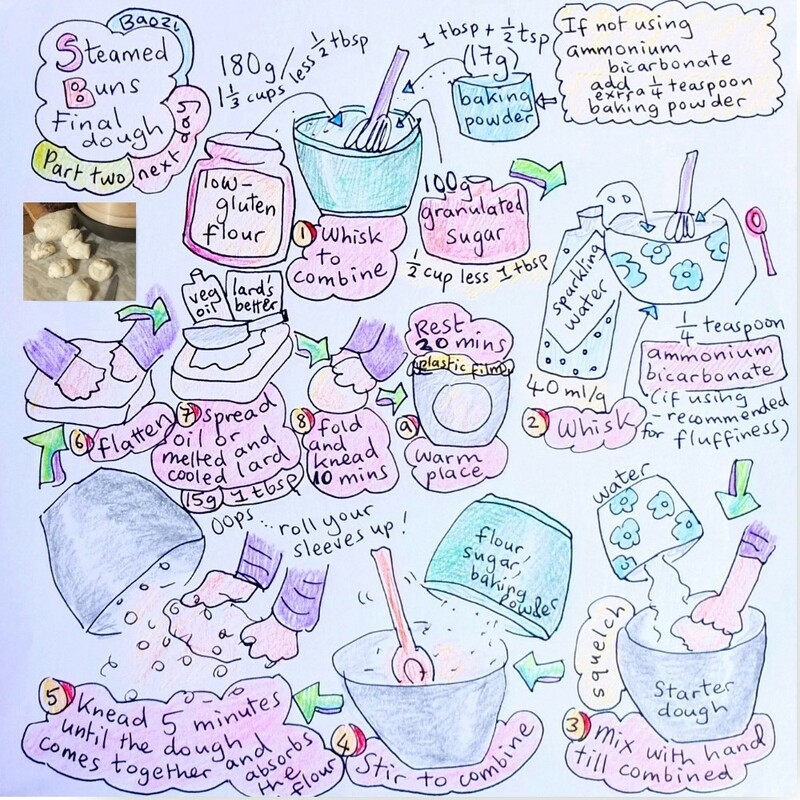 I followed the recipe in The dumpling sisters cookbook by Amy and Julie Zhang, with just a few additions, drawings and minor changes to the instructions. The ingredients include ‘low-gluten or low-protein flour’ which is easy to find in Chinese supermarkets. It’s more difficult to locate the ammonium bicarbonate which gives your buns extra fluffy texture and rise. But I recommend using it and it’s sold in pharmacies/chemists or on Amazon. It can be replaced by baking powder, which I tried because my ammonium bicarbonate went flat in humid Barcelona (aargh, keep yours well sealed and don’t let any air in). With all baking powder and no ammonium bicarbonate your dough is a little less fluffy (and possibly a tiny bit chewy) but still has a wonderful texture and is delicious. Timings: make the dough over two days. First day: starter dough – 10 mins then resting time 8-10 hours (or more). Second day: final dough – 20 mins then resting time 20-30 minutes before filling. 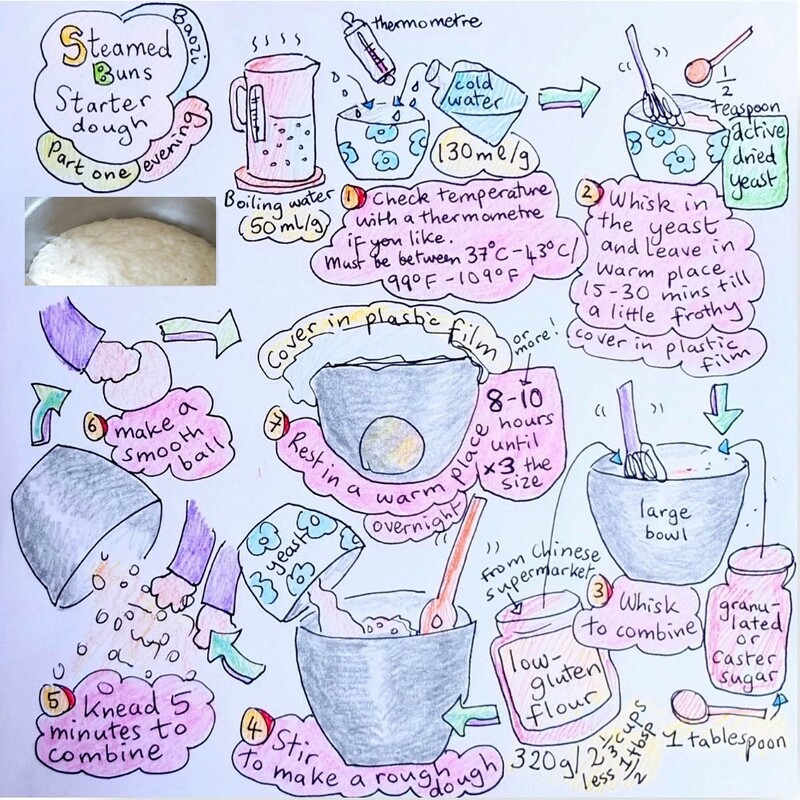 Whisk the yeast into the warm water (see instructions above). Let it activate for 15-30 minutes in a warm place till frothy. Don’t worry if it doesn’t become very frothy – it will still work but more slowly. In a large bowl whisk together the flour and sugar then stir in the yeast mixture with a plastic spoon or rubber spatula until the dough comes together. Scrape onto a smooth work surface and knead five minutes until smooth. Place in a large clean bowl and cover with plastic film then leave in a warm place overnight (8-10 hours) or until it more or less triples in size. It should be very frothy. Whisk the flour, baking powder and sugar together in a large bowl. In a small bowl dissolve the ammonium bicarbonate (if using) in the water. If not just use the water. Pour the water into your starter dough, squelching it in with one hand until the mixture is combined. Stir in the flour, baking powder and sugar. It will be dry and not yet combined. Tip onto your worktop and knead until the mixture combines into a dough. At first it seems it will be too dry but if you keep kneading for 5 minutes it will come together. Flatten the dough a little and spread on the lard or oil (you can do this with your fingers). Fold over and knead again for 10 minutes until your dough is lovely and smooth. It should be more elastic and looking shinier. Tada! Lovely dough to make fluffy steamed buns. 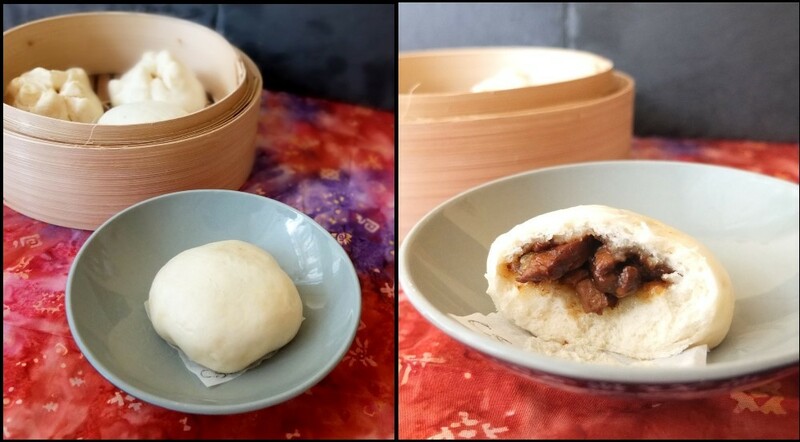 You can make plain buns or for instructions on how to fill and steam your baozi check out my Char siu bao recipe. Fill with barbecue pork, minced pork mixture, Chinese sausage, curry or salmon teryaki … there are endless possibilities. Boeuf bourgignon is absolutely delicious in a steamed bun! 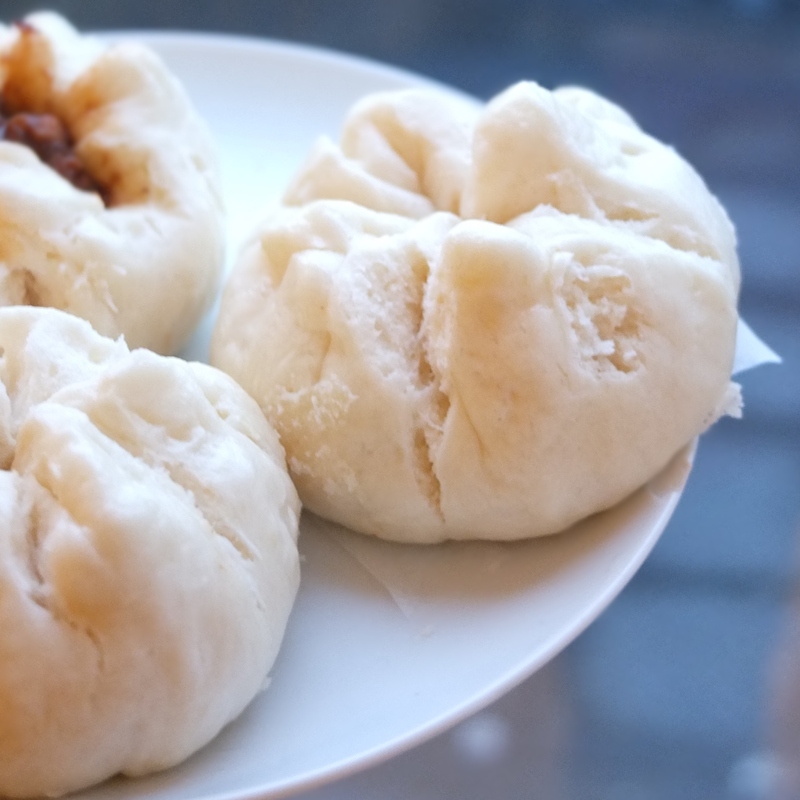 I was bowled (bao-led) over by these buns. 🙂 Give them a go and let me know what you think!